The intel map is a web application operated by Niantic Labs which can be used to view any portal, link, control field or artifact in the world. It also lets you view your AP and XM, use the comm, redeem passcodes, send invites, and view missions and anomaly clusters. 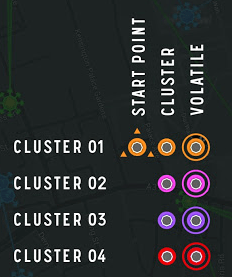 You can view the intel map at intel.ingress.com. The intel map can be viewed on both desktop and mobile devices. The rest of this article describes the desktop version, but be aware that the mobile version lacks some of these features. Note that the intel map currently does not support Facebook sign-in, so in order to view it, you must have your agent account bound to a Google account. When you first sign in, it will be zoomed out so that you can see the whole world. You can pan and zoom to find a particular location, or tap the geolocation button (crosshairs) to zoom in on your device’s location. Keep in mind that it can take some time to load all the map data. As you move around, the cell located at the center of your view will be outlined in orange, although you may have to zoom out to see it. The missions button at the lower-right displays a list of the top 25 missions in your map view. Clicking on a mission will center the map view on the start portal and filter it to display only the portals that are part of the mission. If they must be visited in a specific order, they will be numbered and connected with lines. Sometimes a portal will have an additional decoration on it to show that there is something special about it. Portals holding one or more artifacts are displayed with a large highlight over the center. Selecting the portal will show which artifacts are present at that portal. Target portals for artifact delivery have a segmented ring around them; the segments light up as more artifacts are delivered to them. You can draw planned links between portals. First, select one of the anchor portals, then click the icon at the upper-right of the portal information bubble, just below the “Close” button. This will highlight the portal with an orange reticle. Now click on the other anchor portal. (The portal information bubble will appear as you mouse over each portal to help you make sure you select the right one.) This will draw an orange link between the two. Any links that would block this planned link will be highlighted with a dashed red line, although note that any links that have been filtered out due to your zoom level won’t be present on the map and therefore can’t be highlighted as blocking. Note that planned links do not consider each other to be blocking. The comm panel is found at the lower-left. It works just like the one in the scanner app, with the exception that there is no range slider. Instead a checkbox allows you to filter chatter and agent actions to just those which occurred within your current map view. At the upper-left you’ll see your call sign, current level, the amount of XM you have and the total capacity of your reserves. Hovering over the level octagon will show you how much AP you have, and how much you need for the next level. Clicking on “Social” displays links to various official Ingress social media sites, as well as a link to the community directory, where you can find agent-created local communities. This last page is a good place to find other agents in your area. Next to that is a link for the Ingress Report, an Ingress news program from the official Ingress YouTube channel; clicking it will pop up a player on top of the intel map where you can view several recent videos. Below this is the total global mind unit score, just like on the intel tab of the ops screen. Below that is the regional score panel, which you can click to expand to see more scoring details for the current cell, including the precise scores at each checkpoint, the top three agents, and the time remaining until the next checkpoint. On the right is a search box where you can type in location names to go to that location on the map. Note that this is powered by the same search used by Google Maps; portal names may or may not work here. Above the search box are four additional items. The leftmost one is labeled “Passcode.” You can click on it to show a field where you can enter passcodes for redemption. Next is “Recruit.” This shows you a field where you can enter an email address for someone who you’d like to invite to play Ingress. Mobile support was added to the intel map on 2 February 2013. “Zipcarmageddon” occured on 2 February 2013. Agents discovered a way to enter passcodes from a promotion with Zipcar en masse on the intel map. In response, Niantic removed passcode entry from the intel map. Passcode redemption was only available through the scanner until 14 August 2014. 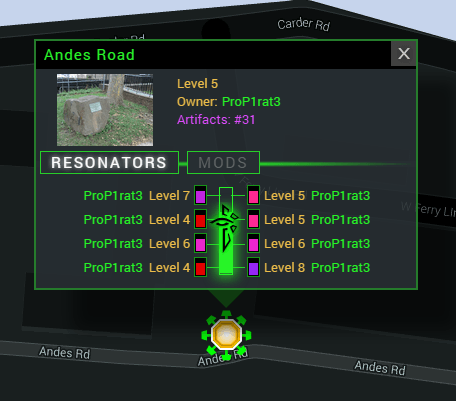 On 18 July 2013, portal filters were added to the intel map. The date a portal was captured was removed from the portal info card on the intel map on 16 June 2014 in an effort to curb automated guardian hunting.